Ok first-up, I don’t understand the fascination with using a ‘z’ for a plural in product names. What does Specialz with a ‘z’ signify? Maybe naming experts think it adds some ‘z’ing to the brand perception. Who knows! Now coming back to what I set out to discuss here, which is Maggi India’s Facebook Brand Page which is being promoted as Maggi Kitchen, a platform for fans to talk about cooking and their related experiences, essentially to promote their cooking base, masala and pastes range. Currently the key campaign is around their new gravy mix product ‘Juicy Specialz’, which comes with a microwave bag. All you need to do is add paneer, veggies and milk and let it cook in the microwave for 5 minutes, much in line with Maggi’s proposition of quick, simple to make and tasty food. The Facebook campaign has been quite nice. For about a fortnight before launch, they ran teaser posts on the Wall playing around with the words 'Juicy' and 'Special', also using some exclusive promo shots of the celeb endorsers (Rahul Khanna and Amrita Puri) to build dialogue that engaged fans. The TVC had an Exclusive Facebook Premiere. Since launch, the wall posts have been around product and ‘how-to-cook’ details. There is a ‘Mothers of India Cookbook’ section which has some ready Maggi Kitchen recipes. 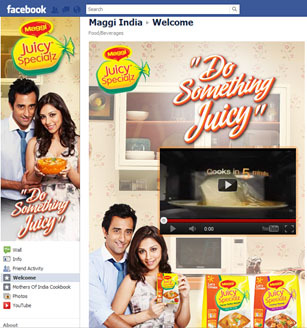 Digital campaigns make absolute sense for Maggi’s kitchen mix products as the TG they want to reach out to is online and is surfing the web for recipes and ways to simplify their cooking experience. Apart from the Facebook campaign, they should look at special integrations with platforms that reach their desired audience. We will see if that happens though.